Styx: Master of Shadows is a slow game where your skill is put to the test. So I'm going to new players, but also for players with less-knowledge, explain the basic rules for the move. Here I will list several topics, to make it clearer for you. There are still some more, but I have listed only the most important. This should be the basis for sneaking and will help you a bit to get through the game. In Styx: Master of Shadows, it is important to keep your environment in mind. Whether it be climbing in a shaft or anywhere on the wall is not relevant, because everywhere could be an enemy or a trap waiting for you. Do you want to remove the selected path, so you should first check that there are many opponents or if it exceeds your ability to climb if you have to climb on the way. Look around you, always check that torch. This can put out in order to remain hidden. Keep an eye out on the gold coins, since only a good scout his area will find them all! In Styx: Master of Shadows, it is important always to look whether there is an alternative. Now and then a short cut is too heavy for you and you need a little longer to get ahead or when the going gets tough, you will be discovered! Seeking small shafts and always looks at a wall to see if there are small extensions where you can climb up. It is usually better to be on the opponents. This one has a very good overview of its current situation. But there are situations where you should be on the floor better. It could be that up more enemies are as below. 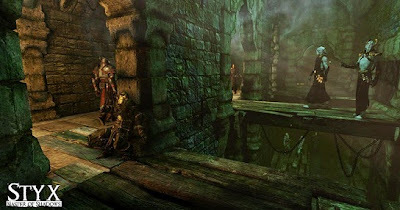 In Styx: Master of Shadows, there are many opponents and also different kinds of them. Almost every one of them has its own way in certain levels. This should be memorized exactly. So you know your path to stay away from opponents. As mentioned in the previous rule, you should put out the torch so that the enemy can not easily find you anywhere. Keep an eye on your opponent so that he can not find you if you are about to attack. In some situations, it may happen that there is only a certain amount of time, where you can run your chosen route. If you miss this, you should definitely seek an alternative route. You can also wait for the time, which is only recommended for those who are patient. In Styx: Master of Shadows can draw the attention of the enemy on itself in a variety of ways. You can by run very fast to get the attention of his opponents. Therefore, you should analyze the opponent and you remember their route so that you know when you can run. Or sneak past them. There are many small objects that move through Poke or fall down and make noise. Thus, the attention is growing on the fallen object and not on you. Maybe you can use this as a diversionary tactic to get further. In Styx: Master of Shadows, you have a kind of magic, which is called here resin. The resin has the main protagonist of skills that can be used for different purposes. You can create a clone which nearby enemies to distract her and thus can continue to run. By using the ability resin is used, which can be refunded if you kill the clone yourself by pressing the key ability. The clone itself has also skills. You can also watch make it invisible and easy to walk past. In this case, however, the opponents stop your steps and watchful characterized. In addition, invisibility uses the most resin. Half of resin bar is consumed there. With the Gold Resin vision you can see where you can climb up and you see the gold coins easily. You look just the torches that can be deleted. Once the vision goes away is the portion that was consumed slowly recharge through the activation again. Therefore, it is always advisable to use it again after a certain time. Styx: Master of Shadows is a very shadow legato playing. It is advisable to stay hidden as the enemy you can not easily discover there. If you come back to again in the shade can you see the tattoo on the right arm begins to glow. This will only light up when you come back to again in the shade. In addition, the screen of your TV is surrounded by a black fog. This happens only when you come back to again in the shade. But you are not completely invisible. If the opponent is too close and you are in his view, he will discover you and raise the alarm.